Is RFID Technology Too Nosy? There are a lot of good reasons why healthcare organizations should implement RFID technology, but privacy and security issues raise debate about its worthiness. Well established in the business world as a means of tracking inventory or as a key component in employee security cards, radio-frequency identification (RFID) technology has been on the market for decades. However, only recently has it begun to show up in other areas of everyday life. RFID technology can now be used to track pets, monitor vehicle traffic, or even follow pharmaceuticals to prevent counterfeiting. And it has been rapidly gaining interest for its potential applications in the healthcare industry. The technology is being considered not only to track equipment or data but people, too. It can be used to track hospital patients or even remotely monitor patients from their homes. However, it is these types of applications that have caused some to denounce it as a “Big Brother” surveillance tool. There are certainly a lot of useful ways that RFID technology could be integrated into healthcare operations, but concerns about privacy and security have continued to linger. And these aren’t issues that have eluded the rest of the world either. When Nike and iPod first released their joint Sport Kit, which allowed runners to track statistics such as time, distance, and calories burned, privacy concerns were also voiced. Fueling the fire was a demonstration in which University of Washington researchers showed that they were able to create a surveillance system that could track people through the Sport Kits. Although the RFID chips provide no personal identifying information, they could still be used as a means of surveillance to keep track of people’s whereabouts—and that had a lot of people questioning whether that was a fair trade-off. Keeping track of inanimate objects, such as hospital medical devices and property, through the use of RFID technology isn’t quite as controversial on the privacy front. Hospitals often have a difficult time keeping tabs on equipment such as pumps, IV stands, and defibrillators. RFID can help because it essentially works like a GPS system, showing hospital staff where to find what they’re looking for. A small tag or device is placed on the equipment and emits a radio wave that can be read by the hospital’s network of receivers. The location of the equipment then shows up on the network. The benefits of tracking medical equipment are plentiful. Knowing where a particular machine is located ensures that it is readily accessible when needed. It also reduces the possibility of it being lost or stolen. And easy access can even keep daily operations flowing smoothly. 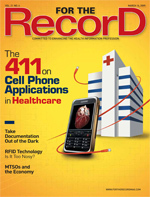 Keeping track of patient data or records using RFID technology can also be useful and even prevent errors. Hospitals often deal with errors associated with incorrect identification, says Rajit Gadh, PhD, a professor and the director of UCLA’s Wireless Internet for Mobile Enterprise Consortium, whose lab has been developing various healthcare applications for RFID technology. Gadh refers to a report from the Institute of Medicine that found the cost of medical errors, including the expense of additional care necessitated by the errors, disability, and lost income and household productivity, to be between $17 billion and $29 billion each year for hospitals nationwide. “I believe that RFID can be a key enabling technology in helping drive down preventable errors,” he says. Similarly, Gadh says his lab has been developing PediaTrak, a technology that would track newborns in a hospital’s nursery. “If there were any unauthorized movement, like the baby heading toward a door when it should not be, then the hospital could quickly locate the situation and deal with it,” he says. Not necessarily, according to privacy advocates, who say it is this type of use—where people are being tagged and tracked for surveillance—that raises flags. They argue RFID is ideal for tracking inventory or perhaps pets but that when it starts monitoring the movements of human beings, a line has been crossed. However, this would require that institutions work to set their own guidelines to ensure that employees—especially those with access to the database—are acting ethically, says Blevins. This is generally a bigger concern with high-profile patients. For example, Cedars-Sinai Medical Center recently told the Los Angeles Times that approximately three or four workers are terminated annually for trying to peek at patients’ records. But even for the average patient, there are frequent news stories of patient data being stolen or compromised. Last year, The Wall Street Journal reported that nearly 50,000 patient records had been breached at NewYork-Presbyterian Hospital/Weill Cornell Medical Center. And last summer, the FBI reported investigating a theft of medical records at Grady Memorial Hospital in Atlanta. While these privacy and security concerns are real, it seems most institutions are still strongly interested in adopting RFID technology in one form or another. A study recently conducted by BearingPoint and the National Alliance for Health Information Technology found that nearly three quarters of healthcare organizations plan to invest in RFID technology during the next two years. As they transition toward adoption, hospitals will also have to work toward establishing their own set of regulations and guidelines to keep the technology strictly controlled. It may have some people anxious about a possible slippery slope, but it seems inevitable that the technology will be widespread throughout the healthcare industry.